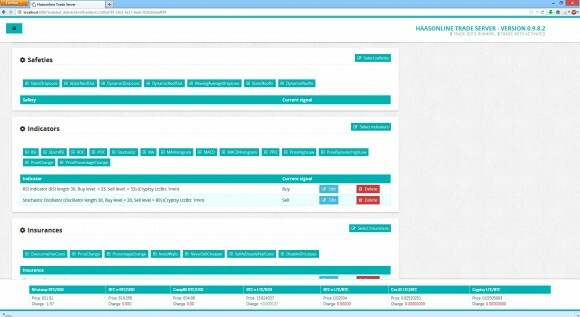 A new version of the Haasonline Automated Trading Bot software was released along with an update for the trading platform for existing users. The new Beginner Trade Bot is a bit more limited compared to the Simple and Advanced versions of the trading software, but also comes at a much affordable price, making it ideal for people that want to try it out first without having to invest a lot in the software for the more expensive licenses. And the good news is that you can upgrade at a later time to the other two versions by paying for the difference, so if you like the results and need more features you can upgrade, if not you would not have paid up to 0.9 BTC to see that this software is not for you. The price for a license for the Beginner Trade Bot is 0.25 BTC and you can get 5% discount if you add the coupon code “5off” (without the quotes) on checkout. 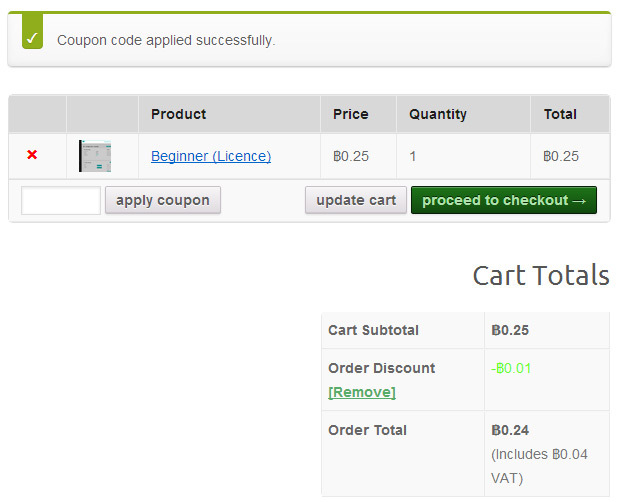 Note that the promo code for the discount can also be used for the other two versions of the software, not only for the Beginner license. The update to the software that existing users have received brought some new features and improvements, but due to changes in how user settings are stored in the new version after upgrading the trade bot configuration and the exchange API keys will be lost and yo will need to set them again and that can be a bit of a bother, especially if you have configured a lot of bots already with different settings. On the other hand there are some useful improvements in the new version along with new indicators, better options for selecting the trading amount that the bot can operate with and more advanced check if the set orders have executed or not. With the older version we had a few cases when an order is sent to an exchange such as Cryptsy and not getting executed for a while without getting removed due to a timeout, so hopefully the new update will fix these problems. We are currently testing the automated trading bot on LTC/BTC trading to see how good it will perform in the current market situation with the Litecoin prices going up and so far we are seeing good results getting some profit from our automated trades. We’ve been playing around and experimenting with the Haasonline Automated Trading Bot software and above you can see an example of how our testing is going on. We have 8 bots currently setup and actively trading and though there are some trades executed with slight loss they are generally making profit. The total profit may seem low, but we are still testing with low trading amounts, so it is normal that when you subtract the trading feed the generated profit from just a few trades is not that high. We are using small amounts from different currencies and with different exchanges in order to see what works better. If you have missed our First Impressions from the Haasonline Automated Trading Bot, then you might want to check it out first in order to have a better idea what are we talking about here. A good advice is to look for crypto currencies that have larger trade volume and not a steady exchange rate, you cannot make a profit when the exchange is a flat line. Another helpful thing is to trade on the CEX.io exchange, but instead of trading GHS there you can trade the LTC/BTC and NMC/BTC pairs. The good thing about that particular exchange is that there are no fees for trading, so as long as you buy cheaper than you sell you are generating profit. Trading GHS/BTC there with an automated bot may not be that good of an idea as it is riskier, but if you manage to configure a good automated trading bot, then you might end up making some nice profit. The other exchange we are testing a lot at is Cryptsy, because there are quite a lot of alternative crypto currency pairs to play with. However not all have large volumes or even if they do, many of them have a steady exchange rate that may be good for the miners, but not so good for the traders willing to make some profit from trading. As a part of our ongoing tests of different automated trading solutions of crypto currencies we have now started testing the Haasonline Automated Trading Bot. We have already tested multiple solutions available for automated trading on the most popular crypto currency exchanges such as BTC Robot, Butterbot and Cryptotrader. All of these have both their own advantages as well as disadvantages, so you should check out our impressions and tests that we have ran using them to trade on different crypto exchanges. Let us get back to the Haasonline’s solution as the next in line for testing. We’ve had our eye on this software for a while already, but what was stopping us from trying it was the fact that there is no trial version available and the price of the software is quite high. With that said this automated trading solution seems to be one of the most advanced one out there and at the same time still being relatively easy for people that are not experienced traders. What is even stranger is the fact that there is not a lot of information available for the Haasonline Automated Trading Bot and no detailed reviews to actually help you in deciding if you should get it or not and the software has been available for some time already. Even the information about getting started and using the software is a bit scarce, so if you are a total newbie you might still have some trouble until you get to know the functionality of the software. We should start with what are the most important features that the Haasonline Automated Trading Bot provides you with. There are two versions of the software available, a Simple Trade Bot currently available for 0.45 BTC and an Advanced Trade Bot being sold for 0.90 BTC at the moment (these are apparently promo prices). So as we’ve already said the software does not come very cheap, but if it can help you actually make some money with automated crypto trades you might be able to quickly get back what you have paid for it. 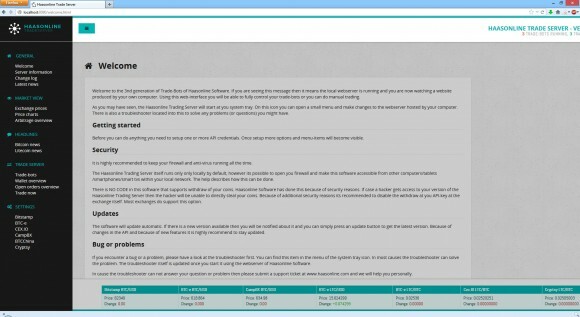 The major difference between the two versions of the trading software is that with the Simple one you get a maximum of 3 trade-bots active at the same time, and there is a limited number of securities and technical indicators available unlike wit the Advanced versions that has unlimited number of active bots and all of the trading options available. Now, what is recommended is to start with the Simple Trade Bot to try it and get to know the software and if you like it and want to get the full extras, then you can just upgrade it by paying only the difference in price to the Advanced version. This means that you can start with 0.45 BTC for the Simple bot and then only pay another 0.45 BTC to upgrade to the Advanced bot. What you should also note about the Haasonline Automated Trading Bot software is that it is something you download and install on your own computer. 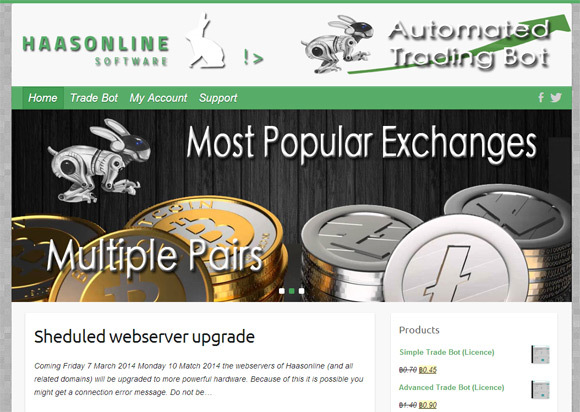 The software runs as a server on your own computer that needs to be on and online all of the time in order to get effective trades and you are controlling it through a web browser. You need Windows Vista, 7, 8 or 8.1 (32-bits or 64-bits) operating system in order to run the trading software, Windows XP and RT are not supported. Now, if you don’t have or don’t want to run a computer 24/7 with the trading software installed on it, then you can get a Windows VPS server and install the trading software on it in order to get it running all the time and being accessible from different locations. Note that the trading software comes with a license for installation on a single computer and the license you purchase is valid for 2 years. 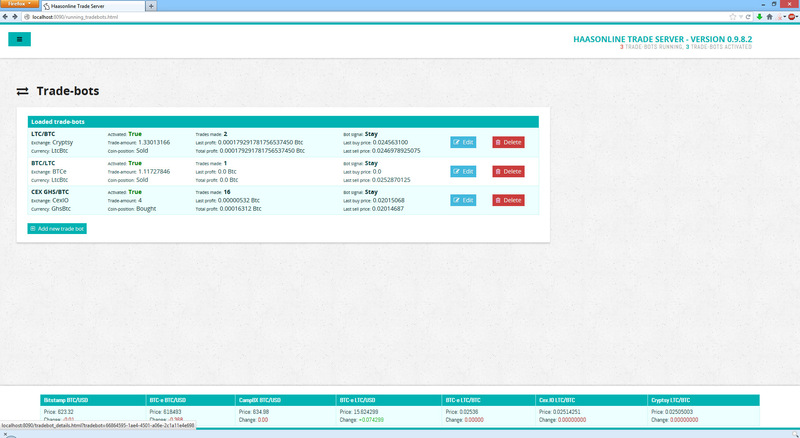 Moving on to what crypto exchanges the Haasonline Automated Trading Bot supports. There is automated support for trading on Bitstamp, BTC-e, BTCChina, CampBX, CexIO and Cryptsy. The two most interesting thing is probably the presence of suport for Cryptsy as this adds a lot of flexibility thanks to the many alternative cryptos traded on that exchange, though CEX support and BTCChina might be interesting for some people. The comprehensive support for multiple exchanges and exchanges that not only trade BTC and LTC, but many other alternative cryptos in a single trading software is definitely a plus. There was also support for MtGox in the previous versions of the trading bot, but now that has been removed as Gox is no more. When you are creating a bot in the Haasonline Automated Trading Bot you need to select the exchange it will operate on as well as what currency pair it will trade with and you can set a limit of the currency that it will be trading with if you don’t wan to use the full amount in the exchange. Then you have three set of tools that can be selected and the trading will be executed based on what Safeties, Indicators and Insurances you have chosen for the bot to use. The Safeties, as the name implies, are tools to protect your from losses in case something serious happens on the market, there are multiple tools that you can use for the bot you are configuring to ensure safe trading. Next are the Indicators – tools that use market analysis based on different algorithm to give signals when the bot should buy and sell. The third set of tools called Insurances are there to help you actually get profit when your bot is executing trades. An example of insurance is to take into account the exchange fees when trading, so that the profit you make should be higher than the trade fee for example, so that you will actually be making money and not trading just to cover the trade fee or even loose money from the trade because of the fee. After you setup your bot you can do a backtest on the already available market data in order to see what kind of performance you can expect before actually activating it and allowing the bot to start trading live. Many of the tools you have available allow for further adjustment of their settings, so you can backtest and fine tune them for better results. The Haasonline Automated Trading Bot has another interesting feature called auto-tune, that basically allows you to automatically tune the trade Indicators of your bot in order to get even better results when the bot is trading. We are still checking out things and getting used to the features of the trading software, but you can expect more information and tips from us once we get better at the whole process of bot trading and optimization. The important thing is that we like what we are seeing so far and we can say for sure this is indeed the most advanced automated trading software for crypto currencies we’ve tested so far. If you are wondering what a good starting point for a trading bot is, then we can recommend to start with RSI and Stochastic Indicators with their default settings and the OvercomeFeeCosts Insurance and then see how the bot will work before starting to play further. And now for some quick results from our first simple trade bot configurations using the Haasonline Automated Trading Bot software and the above advice we have shared about the two Indicators with their default settings and the Insurance for the fees. Note that on CEX there is no trading fee, so there is no need to use the OvercomeFeeCosts Insurance there anyway, but on Cryptsy and BTC-e there is a fee for each trade. We have setup LTC/BTC trade bots for BTCe and Cryptsy as well as GHS/BTC trade bot for CexIO and within an hour we got a few trades executed realizing some profit. Note that we’ve allowed the bots to operate with only small amounts of currency while we are testing, so even if we got something wrong we would loose only small amount. The good thing is that the software allows you to set limits on the amount of cash or crypto coins each bot can operate with. That is why our profits from the trades of the bots may seem so low, by using larger amounts for trades you can realize more profit, but the risk of loosing more is there as well, so be careful with that when you start trading at first and haven’t setup enough protection features for your trading bots. This pretty much summarizes our first thoughts and impressions of the Haasonline Automated Trading Bot software, but we’ll be keeping you up to date how things progress as we get to know the software better and have more experience configuring and optimizing the trade bots for different exchanges and crypto currency pairs. For the moment we like what we are seeing and we already got some positive results from the first trades executed with a very simple configuration for the trading bots we have setup for three different crypto exchanges. We are very positive about this automated trading software for the moment and hope we’ll soon have more information to share with you. Again if you are interested in checking it out, you better get the Simple Trading Bot first as you can always upgrade it to the advanced version later on by paying only the extra difference should you decide you need all of the features available.